seat or trunk. To do this, remove and raise the rear seat or trunk mat. Turn the contact on and off several times and check whether the needle is fully moving. If there is no movement, check the fuse. The fuse panel can be under the hood or under the dashboard. Each fuse must be marked with a current and digit or series of letters indicating which circuit protects the fuse. Refer to the maintenance manual to determine where the fuse panel is and which fuse controls the fuel gauge system. Replace the fuse if it is defective and check that the spare fuse has the correct amperage. 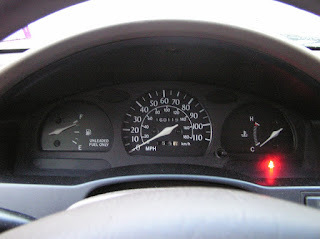 Connect the jumper to the ignition switch and the connector on the back of the fuel gauge, and then turn on the car. If the meter is working now, replace the faulty wiring between the meter and the ignition switch. Ground the meter by soldering or cutting the end of the jumper to the meter ground terminal and the other end to the clean contact point on the car frame, and then turn on the car. If the meter starts to work, replace the ground wire of the faulty fuel gauge. Ground the transmitter block with the jumper using the method described in the previous step. The transmitter can be grounded by attaching the auxiliary wire to the outside of the fuel tank or the frame of the car. Replace the transmitter ground wire when the instrument starts. Disconnect the wire connecting the fuel gauge to the transmitter, and then turn on the car. If the fuel gauge indicates that it is full, it indicates a problem with the sensor or mechanism in the tank. If the meter continues to show a blank, you may have a faulty fuel gauge that needs to be replaced. After replacing the fuel gauge, if a problem with the readings remains, contact a specialist. Make sure there is fuel in the tank before you begin these steps. Before touching live wires, disconnect the battery from the vehicle.